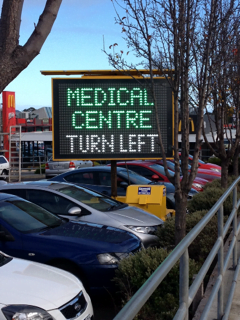 Why should you consider using a Variable Message Sign, also known as a VMS, for your Roadside Advertising? A lot of people don’t realise the versatility and usefulness of a Variable Message Sign. They can be used for more than just conveying messages. Below I have listed a few ways that you can use a Variable Message Sign to increase traffic to your business or event and make it stand out more. 2. Advertise your trading hours. 3. Direct traffic to your car parking. 4. Announce a special event. For example, new stock, store refurbishment, new staff member, senior’s week etc. Advertising Signs can update your regular customers and make potential customers interested. For Example, BOBS BEDS; CHECK OUT OUR INFLATABLES. Remember the role of the Advertising Sign is not to sell the product, it is to get people interested so you can sell it. 5. Build a relationship with potential customers. Wish people a happy day, advise weather conditions, countdown to Christmas or opening of the Snow Season, advise of events coming up that relate to your business (for example Bridal shops or Wedding Venues announcing upcoming Bridal Expo; Car Dealerships and Tyre Shops count down to Bathurst or Phillip Island Grand Prix). Think of what you think your customers might be interested in and use your Variable Message Sign to connect with them. The mere presence of a Roadside Advertising Sign makes people aware of your business and that something special is happening there. People may drive past your property hundreds of times and not be aware you are there. Put in a Roadside Advertising Sign and suddenly they notice you. 7. Help people navigate their way around big events. If you have a large outside event going on its easy to get lost or overwhelmed. Variable Message Signs can break your event into zones and reduce visitor anxiety, either by using your VMS to give directions or announce special events or highlighting what is where. For example, WOOD CHOPPING AT 3PM SMALL ARENA; HAND TOOLS ->; HANDY MAN ZONE. Remember always to keep your Advertising Sign messages simple and clear, and let your VMS do what it does best – promote your business.